We provide a complete array of geothermal system configurations to meet the needs and budgets of our customers, from standard ground to air geothermal units, to split geothermal systems, to one-piece outdoor heat pump geothermal systems with indoor blowers. GeoComfort Geothermal systems have greater equipment reliability – longer life and fewer repairs as compared to conventional heating and cooling equipment. 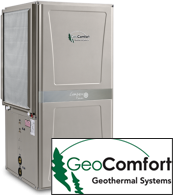 GeoComfort Geothermal systems increase the value of the homes of our customers.